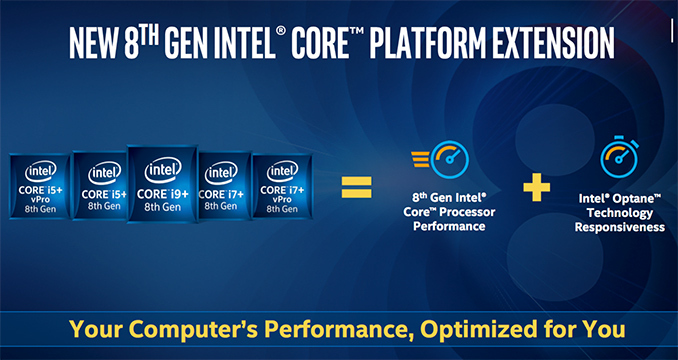 Earlier this month Intel introduced its Core i+ processor brand for desktops and laptops. The brand-within-a-brand setup sees Intel's 8th gen Core i5, i7, and i9 CPUs bundled with its Optane caching SSDs (aka Optane Memory) and sold as the i5+, i7+, and i9+ respectively. The chip giant aims such CPUs at customers who would like to improve performance of their storage subsystems yet won't be investing in full-fledged SSDs. And, after showing up in OEM systems with last week's launch, the Core i+ processors are now also to retail buyers. Overall, Intel is rolling out the Core i+ in retail, targeting DIY end-users in the U.S., Canada, and Japan. 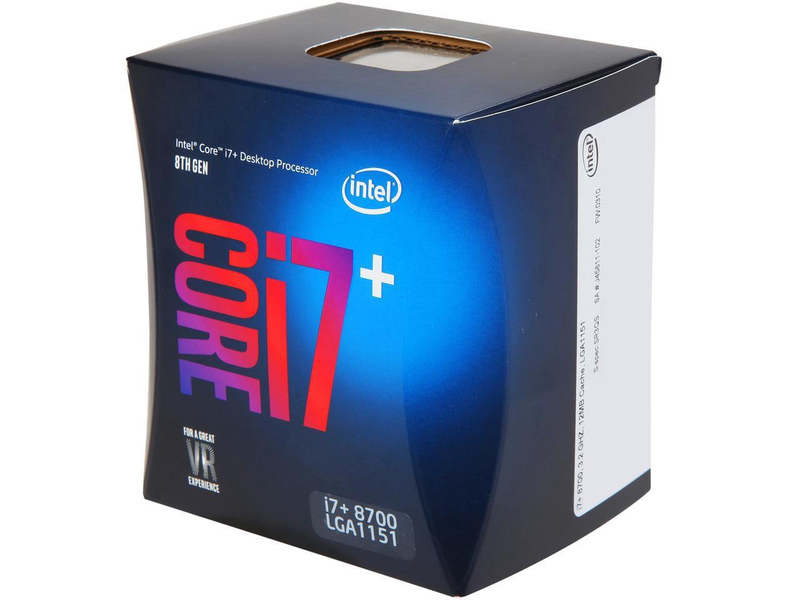 The lineup of Intel’s Core+ CPUs for desktops currently consists of three SKUs: the Core i7+8700, the Core i5+8500 and the Core i5+8400. The bundles include 16 GB Optane caching drives and are priced at $340, $240 and $215, respectively. For mobile computers, Intel is also offering Core i9+ processor bundles, but it remains to be seen whether the company also plans to expand the family of its Optane-bundled offerings for desktops. 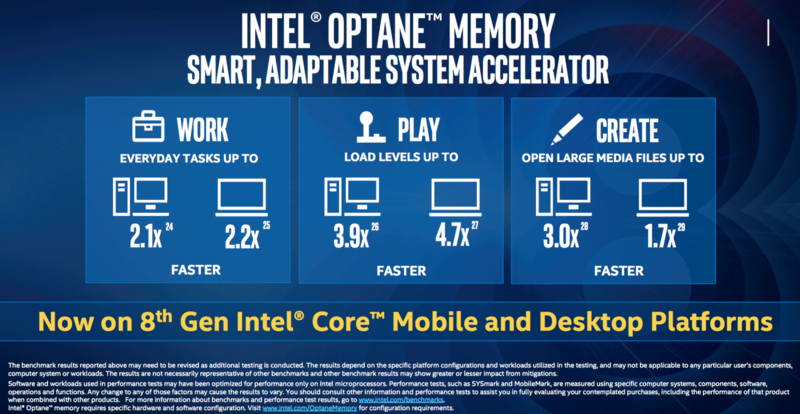 With its Optane Memory products, Intel is attempting to kill two birds with one stone. Firstly, the company is capitalizing on demand for high-performance/high-capacity storage subsystems that combine responsiveness of SSDs and capacities of HDDs. Secondly, the company is ramping up production of its 3D XPoint memory and gaining experience in its high-volume manufacturing (i.e., improving yields), something that it is going to need to address needs of datacenter and enterprise market segments going forward. This increased focus on selling lower capacity Optane modules for caching comes as Intel has made some notable changes to their caching subsystem to improve its usefulness. The Optane software can now cache data from any HDD (not just the primary/boot one), opening up interesting usage scenarios with secondary HDDs for end-users who have already invested in a SSD for their boot drive. 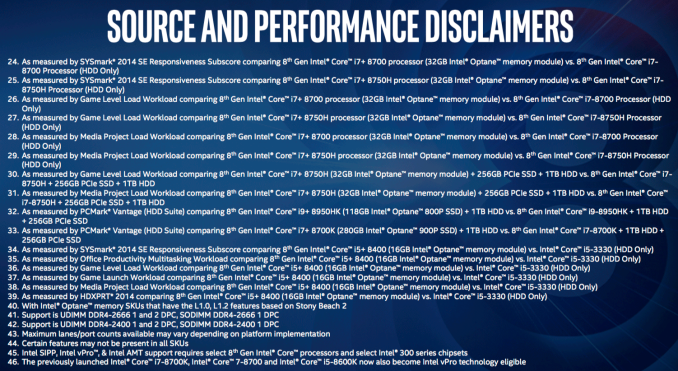 Intel says that a hybrid storage subsystem accelerated by a 32 GB Optane caching SSD is 1.7 – 3.9 times faster when compared to a non-accelerated HDD-based subsystem (see the slides below for details). The performance boost only occurs in situations when cached data is used, so a caching SSD is not a replacement for a regular SSD. However, it is considerably cheaper and since it does improve user experience, it makes the Core i+ bundles particularly useful for PC makers. Last year Intel teamed up with select makers of motherboards to bundle its Optane caching SSDs with their platforms. This year the company is shifting its strategy and intends to sell such drives with its CPUs. Even in the world of SSD's there are fast ones and slow ones, and this is decidely fast. Traditionally, there was a saying "the steady state of a hard drive is full". These days, plenty of people simply don't fill up more than 100G of space (obviously neither gamers nor other heavy computer users), and thus don't need rotating rust. For everybody else, $50-70 for a few terabytes is a godsend, and simply a required item in any build. Of course, once you start collecting a few of these there is the obvious question of leaving them in your PC or adding a NAS. Single users (or only heavy user in a family) can obviously get away with leaving them in a PC, but others will want the NAS (if only for media storage). There's also the issue of windows occasionally simply *has* to spin every drive it has. That is annoying. I don't think I've seen this in Linux even though Linus has been quoted in the "all rotating rust belongs in a NAS" camp (the actual quote was more about "PCs should be all SSD"). I had high hopes for the 32GB Optane and tried with the boot drive prior to this updated driver, but I had to completely give up. I didn't see much difference or at least I wasn't patient enough, but the most grating was the constant temp freezing, unresponsive pauses as the optane caching software stack does it's thing to try to analyze and shuffle files around. Are all those performance numbers in comparison to a purely traditional HDD setup?